Bay Beans are extremely proud to hear great feedback from our customers. Please allow me to share with you some of our customer comments and reviews of Bay Beans coffee beans. If you would like to offer feedback, please leave your comments below. Submit your own review of Bay Beans. I have been ordering Espresso Master beans from BayBeans for close to a year now. I have tried so many different types of coffee beans over the past 10 years and the Espresso Master tops my list for my flat white coffee. Bay Beans definitely deserves a 5 star rating for taste and service. Thank you James. In the years dealing with James I have always found both the Coffee Beans AND James as good as one can expect. James makes the whole exercise a pleasure. The experience of buying the beans and the pleasure of drinking the coffee - always satisfying. On Ebay they would call him a "Good Seller" and the beans are all excellent roasts and flavours. His delivery system has proven timely and reliable and the costs are extremely competitive. On the occasions I have contacted James he has always been courteous and co-operative and I always come away happy to do the business. Long Live Bay Beans Coffee! ​I purchased my own cafe two weeks ago and changed the coffee to Bay Beans Forte. My customers love it and my coffee sales are increasing every day! Your customer service and fast delivery is also fantastic. Thank you! Espresso Master coffee beans arrived today - the best coffee I have had in years! I will not buy from any where else from now on. yum yum yum. 5 stars for incredible service and quality coffee. Ordered my coffee on Thursday and delivered on Friday! Thank you so much and the Mocha Prince is a winner. Amazing fresh coffee and the easiest online buying experience. All varieties are great but the Forte is my favourite! Each Bay Beans delivery is like Christmas. I even let the delivery guy smell the box so he can enjoy it too. So fresh, so tasty. Awesome online coffee experience. Not only the best coffee but also the quickest and best service! I've been searching for a decent decaf that tastes like real coffee, I've found it!! Full flavour with a strong depth. I Love it so much just have dropped the milk completely. Beautiful coffee! I first bought coffee from the supermarket to try out my new machine, the coffee I made with these super market beans could have been used to paint onto sneakers to stop dogs chewing them. I really thought I had made a mistake buying the machine until I tried Bay Beans coffee. I just ordered two more bags, Thanks. A rich full bodied coffee blend with low acidity cocoa notes and syrupy body. If you like your coffee full flavoured without bitterness or sour top notes then this is a blend for you. There's nothing fruity or punchy about it, just a deep, rich and smooth blend. Excellent for those who favour Asian bean profiles. Just ordered my second kilo of beans from Bay Beans. Going to drink my way through their entire selection. Keep up the good work James and team! James, Your blends are the best coffee ever! We are onto the Espresso Master now after the Super Crema. My favourite, for a few years, has been Voodoo Espresso Heart Blend …yet that has been eclipsed by your coffee. I've learned to really appreciate the quality of my regular Bay Beans coffee deliveries. I recently ran out of Bay Beans, so I got small bag of beans from a local café. I was very disappointed, nowhere as good as my regular beans! By the time my Bay Beans Mocha Prince beans arrived a few days later, I was ready to dump the café beans from my grinder’s hopper in favour of the Mocha Prince beans. Thanks to James and everyone else at Bay Beans, please keep the beans roasting! James recommended Mocha Prince for French press coffee. I love it! The delivery was super fast.. I got it next day..
​I ordered the organic free range coffee beans with an Aeropress grind. I submitted my order on a Saturday afternoon and it was delivered on Monday, much faster than I was expecting. The coffee is a stronger taste than other beans I have used with the Aeropress but still a great cup of coffee. ​The best decaf in Australia - I've never tasted such a well rounded strong decaf coffee like this in any cafe. I no longer go out for coffee! James has never let me down with his quality of the coffee he sends and the service he provides. Keep it up, Bay Beans!! Wow! Amazing service, thanks James for the next day delivery. I got the Fair-trade organic, smells freshly roasted and amazing crema that I haven't seen my old Sunbeam pour in a long time. I have finally found my regular supplier, keep up the good work. I just finished all 4 packs from my Variety pack of coffee beans. I have to say that I am quite impressed with all of them. I have bought beans from about 5 different suppliers before but my taste buds enjoy James' coffee the most. The winner out of four samples is probably Mocha Prince - so smooth and sweet especially if I drink just black coffee without milk. Thanks for the great coffee James. I bought the variety pack to try and all the family have their favourites. So fresh, strong and delicious! I ordered my coffee beans in the morning and received my beans that very afternoon! Fantastic service. I look forward to trying them out. I bought the Variety Pack and Fairtrade coffee beans - I love them all, especially the Mocha Prince! Fresh coffee beans, great online service and speedy delivery. Many thanks. The Super rema is awesome. Bay Beans is the best I have ever tasted. James is fantastic to deal with. Highly recommend these coffee beans. You can't go wrong. Fantastic service. I am just about to put in my third order with James, I have been so impressed with his wonderful coffee beans and also his great old fashioned service. Makes you feel that you are not just a number, but a real person. Thank you..
Great Decaf coffee, delivered regularly and never a problem. Many thanks. I keep buying the Espresso Master coffee beans for the strong, silky flavour, no bitterness. Thank you James! Awesome service, too! Wow! From the incredibly fast delivery to the amazing and delicious coffee beans, we are so glad we found Bay Beans. These are better than our local coffee roaster who we previously thought was the best we'd found and we are telling all our friends and family. The only trouble is we can't decide on a favourite. Currently the Mocha Prince is in the lead but we have yet to try them all. Thank you again. Simply perfect coffee and perfect service. Hi James. I'm a regular but I still need to say "thanks". I ordered Tuesday and my delivery just arrived - before 9am on Wednesday. Great coffee and terrific service. Thank you. Roger. I've been buying my Bay Beans for some years now and I would recommend to any serious coffee drinker, my personal favorite is Mocha Prince... yum! This is the coffee I have been looking for my whole life!!! After looking online and reading many reviews on different coffee's I bit the bullet and decided to buy a couple of different one's from various sources. Not only was the service from James at Bay Beans personal but also incredibly fast. I ordered the Forte blend and was absolutely thrilled with both the taste and texture of the coffee. Right from when I first opened the bag, I just knew I was going to be in for a treat. Thanks you so much James for finally giving me a coffee I can sit and enjoy that takes me away to a whole other place. I will definitely be a regular buyer after this and couldn't imagine being satisfied with any other coffee now. I am ruined (or spoilt) for life. Tried these beans for the first time today and they do give great crema and taste fantastic too Excellent service. Quick delivery. I came across Bay Beans per chance, then asked around and given I'm a newbie to elite coffee making, I thought I would give James' coffee beans a try. James is a professional - he attended to my emails promptly and my coffee beans were delivered within 48 hours, nicely packaged and boxed. The beans (Super Crema) are amazing, it took me two attempts to dial in the grinder and have pulled perfect shots every time, which is the first time that I have done that since purchasing my machine. Equipment: Faema Carisma S1, Baratza Vario grinder and a 500gm cobra Tamper. James, keep up the good work, you've won me over. Bay Beans Coffee is the best source of high quality, consistently excellent coffee beans! We've tried multiple others but keep coming back to Bay Beans, particularly the Espresso Master. I think we've finally decided to just keep buying from here and be forever happy with our coffee!! Thanks again, keep up the good work! 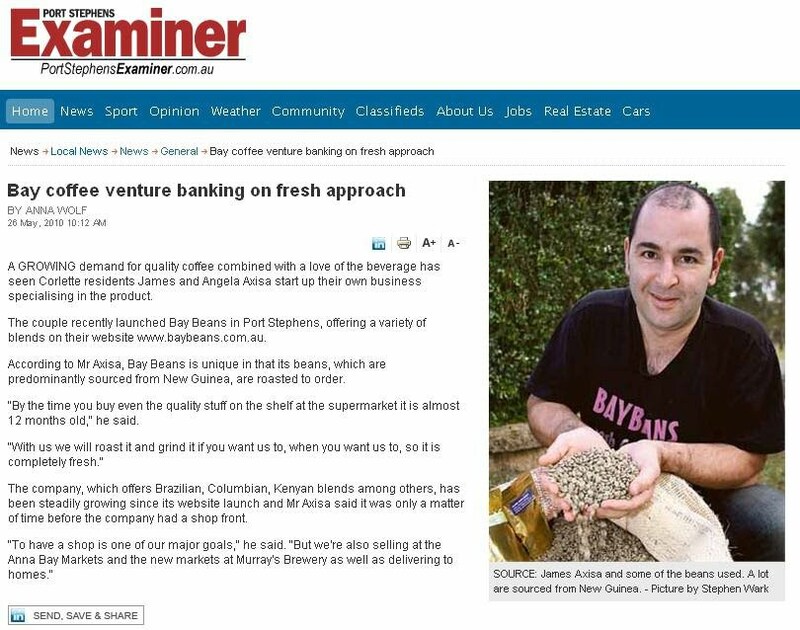 G'day James, We have been buying from Bay Beans for quite some time and still enjoying your coffees. We are both retirees and go shopping without going to the coffee shops around Cairns where they all think they serve coffee. We now leave home having coffee from James first!! The best decaf beans around and awesome consistent customer service. Keep up the good work James! I had my first experience buying coffee beans off you this week and I felt compelled to tell you how excited I am. First off, after ordering Saturday night and being from Toowoomba Queensland, I was expecting delivery maybe Wednesday or Thursday and was over the moon when I heard a knock at the door Tuesday! So thank you very much, you have earned yourself a regular customer. I had the coffee beans arrive today in record time. Super fast service. I pulled a shot and that is super creme. Fantastic taste, fresh beans good service. What else could I ask for? Thank you for the beans. Exceptional customer service! I Ordered my coffee beans at midday and got it delivered to my door early morning the next day. The mocha Prince coffee tastes beautiful. Super Crema coffee beans is the first coffee I've ordered and have loved it! I will stay with this for a while as the flavour is nice and rich plus the crema I get when extracting, I've never seen before with other coffee beans. James' customer service is second to none which is a huge bonus! Hi James, Just wanted to let you know that the Espresso Master coffee beans are outstanding. Great flavour, body and aroma. Really enjoying them! Thanks James. My coffee beans arrived quickly and well packaged (I have ordered from other companies and the coffee package has arrived damaged and open). Your Bay Beans coffee was great tasting!. I will be trying Forte next. I placed an order on Sunday and received my beans on Tuesday to my door! Great service James, and my coffee never tasted better. I look forward to trying more of your varieties. After trying Bay Beans Super Crema coffee beans, I was satisfied again and again. In my lay opinion, I place this coffee near, or at the top of world coffees, and I have been searching and sampling coffee for a few years. Hi James, We have really enjoyed the smooth flavour extracted from your coffee beans. I have had an order from Campos Coffee, Coffee Hit and Bay Beans in the past few months. We decided that Bay Beans was the winner. Thanks for a great product and good service. Great service and quick delivery! I ordered forte and it is the best coffee I have had in a long time. I am very happy and will be ordering again the future. James & all at Bay Beans, I have been ordering from you for about 2 months now and I would like to thank you for your very fast delivery and outstanding coffee. We have tried Forte, Super Crema & now Fair Trade - all are fanstastic. Thanks again. We love your nespresso capsules!! We have been ordering for a few months now (the organic and decaf varieties) and they are so good we rarely buy coffee at cafe's anymore! The service is amazing. 2 days ago I realised we were running low, placed my order and this morning the coffee capsules arrived. As promised "Good Old Fashioned Service" Order came day after placing . James also responded almost immediately with the status of my order. Certainly a great business ethic. As for the coffee very happy with our selection of the Super Crema. Thinking of giving the Espresso Master a go also ! After trying various coffee blends I finally hit the jackpot with Super Crema. Lovely aroma, thick crema, no bitterness in a smooth shot that delivers. Recommended without reservation. Top product. Hi James, I just wanted to let you know i have tried veneziano coffee, dibella coffee, dimatina and toby's estate coffee and I believe you make the best coffee! Bay Beans forever. Kind regards, Joe. I just wanted to drop you a line to say "Thank You" so much for your prompt, professional service and the delicious Nespresso coffee capsules you supplied me with. We were extremely impressed with the lovely email you sent within hours of my order being placed and I will have no hesitation in recommending your company to all of my friends with Nespresso coffee machines. Thank you so much yet again. Warmest Regards, Raelene. Hi James, Just a quick one to thank you for your outstanding service today. I was amazed to see our coffee on our doorstep only a few hours after I placed the order. Like magic! Love the coffee and the pricing is perfect! Delivery is super quick! James is always helpful and reply's to emails himself. The Premium blend is my favourite. Thanks Bay beans for making me smile in the mornings. Incredibly quick and personalised service. Ordered on Monday morning and had the beans early Tuesday afternoon, with a couple of emails in between. Most importantly, the coffee (mocha prince) is lovely. James provides a friendly and personalised service. The Bondi Chai Club Cinnamon is my favorite as in my first order I tried both just to be sure! I am looking forward to trying the Authenic Chai! The product is delivered in lightning fast speed! Thanks James. Hi James, Just tried your SUPER CREMA - BEST EVER!! Thanks for your suggestion, Harry. Awesome coffee beans great taste and aroma, will gladly buy from you again. I couldn’t tell much of a difference to di’bella’s cup of excellence blend. Have been buying Bay Beans for 6 months now for home use. Absolutely divine product and service. Thank you Bay Beans. Ordered on Sunday, got the beans mid-day Monday! Great coffee with thick creama. Would buy again! Ordered coffee beans at lunchtime. Just got home (5:30pm) and they're sitting on the doorstep! Outstanding service! I have just received my Premium Reserve coffee beans. Thank-you! I am extremely impressed with your service, communication and speed of delivery. I can't wait to try out the new coffee beans. I want to comment on just how impressed I am with the fast delivery, almost instant. I received my coffee beans I ordered the very next day. Thank you for such a great service! I tried the Forte coffee beans recently and couldn't be happier. Thank you very much for the great product and service. We shared the Forte beans around with some friends who were also impressed, so I think there may be some more orders coming through from Victoria. Hi James, I wanted to say I received your coffee beans yesterday and have loved to whole experience, from your personal email to the quality shipping to the taste of the beans. I have already recommended you to some friends. The best coffee I have purchased, by far (and I have bought from roasters all over the country). Awesome service, awesome prices. Tried your single reserve in the Hario coffee siphon. I haven't had coffee that good in years! Perfection is an understatement! Just letting you know, I have been having some of the super crema over the last few days, delighted with its smoothness and taste. Really does produce quite an extensive crema I have noticed. Will be buying some more for sure, I have spread the word over the last couple of days to friends and a few friends have been over today and thoroughly enjoyed it also. G'day, I just tried your coffee and it is the best I have had in some time. Who ever did the roasting and blending is very skilled. Thanks! Bay Beans is awesome, it's as simple as that. Both Forte & Espresso beans produce great coffee with my Lelit Combi. James also provides a fantastic service, great product + great service = happy customer! Good morning James. I thought that I should say how good your service is - my coffee arrived this morning, just 48 hours after I placed the order. It would be hard to expect better service than that. Added to the excellent service, the coffee is great too - both Forte and Espresso make a great coffee in my Rancilio. I received my order yesterday and have made two delicious Mocha Prince lattes since. I will definitely order from Bay Beans again. Thank you for the excellent customer service! Just tried your Forte beans and it's the best coffee I've had so far. Very pleasant after taste, not bitter, smooth rich, a lingering chocolate taste. Well done. I have today received my Bay Beans coffee and started using the Espresso Master. My wife & I think that this is the best coffee we have ever tasted. I have been ordering from Bay Beans since about December last year. Never a single problem, orders are fast, service perfect and emails always responded to ridiculously quickly. James obviously runs a business that he wants to grow and seems to put in effort to making it work. If you order with mates at work (say a group of 5) he does great wholesale prices everyday of the week for 10kg minimums. I bought the Forte coffee beans from Bay Beans a few weeks ago and have been very happy with the taste. James roasts them fresh so the aroma/taste is far better than any supermarket bean that has been sitting on the shelf for weeks(?) on end. I'll now try his espresso beans. I'd recommend the quality to anyone for sure. Hello James. I appreciate your email and the fantastic service you provide. This is the second time I have ordered from your company and I'm very happy with the excellent coffee you have. WOW! My beans arrived this morning in VIC. That's bloody quick turnaround. Great coffee and great customer service. Thanks James. I bought 1KG of Mocha Prince from Bay Beans …can't wait. Side note, I sent an email to James about degassing and he responded within minutes. Awesome guy! We are coffee drinkers for about 12 months now and we have tried that garbage you can buy from the supermarkets, well that was just a waste of water for me. Then I purchased your coffee beans and wow we actually discovered what real fresh coffee tastes like. We can't even bring ourselves to buy a coffee when we are shopping as it disappoints us now. Thanks again, your service is excellent - I tell anyone who will listen. Thanks again for the fantastically prompt service, oh and the great beans! Very fast delivery, 1-2 days as promised. Well done! I really enjoy the pleasure of grinding coffee by hand each morning. In the same time it takes for the kettle to boil, I have ground my morning's coffee, and the aroma is fantastic. The quality and simple design of the Hario grinder is better than I expected; cleaning is a breeze. I even bought one for a friend's birthday; he loves his too. I wanted to let you know how many comments I have had from people about your coffee when they come over for a cuppa. Without fail I am constantly being told how delicious it smells and tastes and asked where the beans are from and for some they say it's the best coffee they have ever had. I still have a kilo bag to go but am already looking to decide my next order. Thank you! Ordered my coffee beans yesterday and they arrived today! If the beans are as great as the service, I'll be very happy & let you know. My coffee machine has some other beans left in it - Where are the coffee drinking visitors when you need'em? I have tried a fair few coffee beans and I can easily say this is the best coffee beans for me so far. The taste is so nice that my coffee tastes like one from a coffee shop or cafe or better I would say. I have just started making my own coffee at home. Just wanted to say thanks for the first-class coffee beans and fast service. I’ve ordered the Forte twice and absolutely loved it – I buy coffee beans from all over the place and Forte has to be one of my all-time favourites. I’ve just put in an order for the Mocha Prince coffee beans to see what it’s like – it sounds great. Thank you for the great service, the coffee beans I ordered yesterday were delivered today! My coffee beans arrived today..fantastic service thankyou so much. Looking forward to it. The best coffee beans online. Forte coffee beans - That has to be one of the best coffee bean blends ever! That was a great coffee! I thought Vittoria was good coffee beans until I tried Bay Beans coffee beans. The quick service and mailing was real convenient. First coffee beans order from @BayBeans. This is "Espresso Master". Huge crema, strong, smooth, creamy with some berries. Picked up my order of BayBeans ground coffee beans from the Post Office & staff & customers commented on the delicious aroma from unopened pack! You should promote your coffee as AROMATHERAPY! My order is sitting beside me and it smells DELICIOUS!! Received my BayBeans coffee beans last week, have been buzzing ever since! James, the coffee is smooth, rounded & delicious. Excellent service too! Bay Beans roast their own coffee beans & do a mighty fine job! I highly recommend a visit to www.baybeans.com.au. Brilliant! I’ll be ordering again. Your coffee beans are delicious! Hi James,Haven't tried the Premium reserve yet, but the Supa Crema is great! I love the aroma of the coffee when it is first poured and then my first sip. It's like going to a coffee shop for a special cup of coffee, only you are at home. I love to impress my family and friends when I serve this coffee. My only problem is that my coffee doesn't last the month. Great thanks James. Unfortunately ran out of coffee beans mid birthday party today. Everyone commented that they enjoyed the super crema! Sublime! Hell, I even went so far as to bloody blog it ;-) http://clubduh.com/blog/2011/01/30/now-extracting/ Keep it up, James! Dear James, I am really impressed with the fabulous service and timely dispatch of orders. My husband and I bought a home espresso machine in November and just love the coffee it produces from the "Sweet Brazil" style and the 'Special" coffee beans. Not that we don't like all the other varieties as well but those two are our favourites. We are as passionate about our coffee "fixes" are you are about producing great coffee beans, so thank you for that. James, you are awesome. I am putting the word out about Bay Beans coffee beans. Great customer service. Thanks for prompt turnaround - coffee beans arrived around 36 hours after order and cheaper than an instore purchase. Nice work. 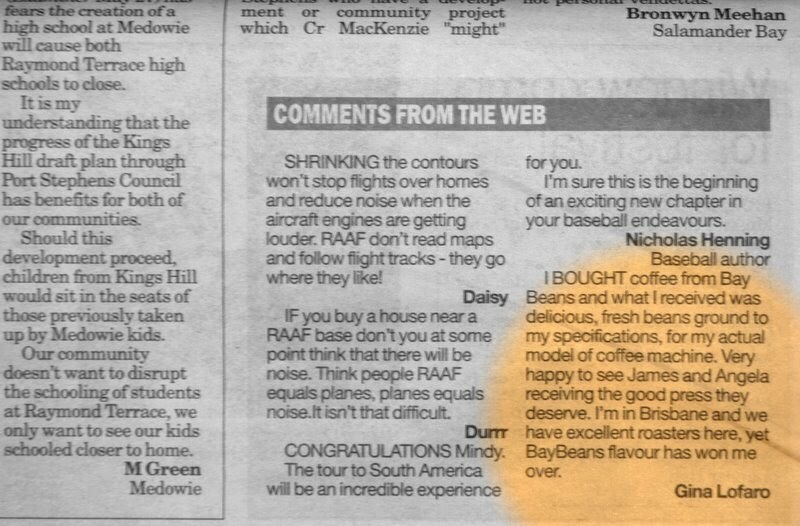 James, Just wanted to say how good your coffee beans are. Don't know what your trick/skill was in your roasting this time round but it is outstanding. I made my first cups with it this morning and the flavour is full, smooth, rich caramel, mocha flavour no clumping and poured beautifully with a golden rich crema...just brilliant. I wanted to let you know as i really noticed the difference. Keep up the good work...i know you are very passionate about what you do & it shows! I’m in no way affiliated with Bay Beans, I bought some coffee beans during their last promotion. I got mocha prince and espresso master and i was pleasantly surprised by both! At home i grind small for my espresso machine, but i also grind bigger for french press coffee at work. Both techniques gave a full flavored coffee with a beautiful creamy aftertaste. Normally i get Campos coffee from Newtown (usually regarded as the best in sydney)… in my opinion, these coffee beans are on par with, if not better than the Campos varies. If you want compare prices, then Bay Beans is the clear winner! I can highly recommend these beans! Love your Fair Trade coffee beans! A smooth, strong blend made sweeter by being an ethical choice. I'm always on the look out for great coffee beans that supports both business in Australia, and across the world. This coffee bean blend has a nice length, and a slight sweetness about it, which made a yummy creamy cafe latte in my home machine that would compete with some of my favourite coffee spots! Great Job James. James, Once again, great coffee beans. I have converted others at work, as the smell coming out of the kitchen when we have the coffee on is great. My favourite is the Brazilian coffee beans, however at work they like the stronger coffee beans more. It depends who makes the coffee in the morning as to which one we have. Now I have my own coffee machine at home...I must be converted! Melissa Edwards, Melbourne. (February 2010)THANKS!!! Package came in on Saturday - our last flight for the year!! Enough to get me through to when I leave in April im sure! One of the other chef's here has lived in India, so we're smashing the chai tea, and your blend is REALLY nice! There was a scientist here who doesn't drink caffeine either, so I shared the decaf love with her - she was most impressed also.. getting the word out for you.. rock on. thanks again for the easy and FAST transactions! Superb flavour, price and service! Have tried every decaf on the market (doctors orders) and Bay Beans blows them all away. You have a new loyal customer.